Full Video Presentation available on the QSG Members Only Page. This course investigates Context of the Organization, a new requirement in ISO 9001:2015. 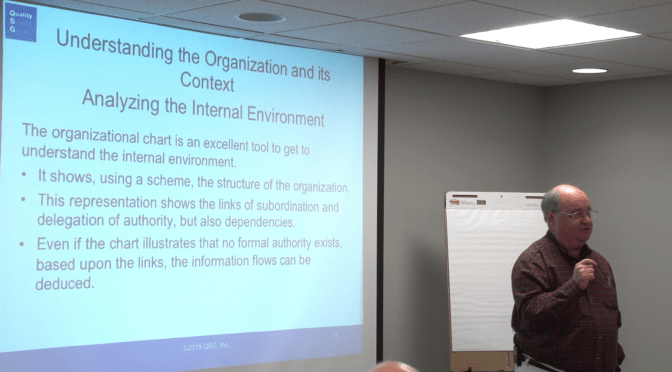 Through training, participants will learn to assess the external and internal factors that affect an organization’s ability to achieve the intended outcomes of its quality management system. Participants will learn to identify tools that facilitate the collection of data that can then be applied to describing the context of the organization, as well as how to address long-term needs and make sure the organization’s quality and business management systems are appropriate, effective, and efficient. This course was designed for individuals and managers interested in learning how this new requirement of ISO 9001:2015 – Context of the Organization – will influence their organization’s quality and business management systems. Thank you for your interest in ISO 9001:2015 Context of the Organization.